Ancestry.com has a database online that is titled - UK AND IRELAND, MASTERS AND MATES CERTIFICATES, 1850-1927 which includes 29 entries for people who listed Greece as their place of birth. 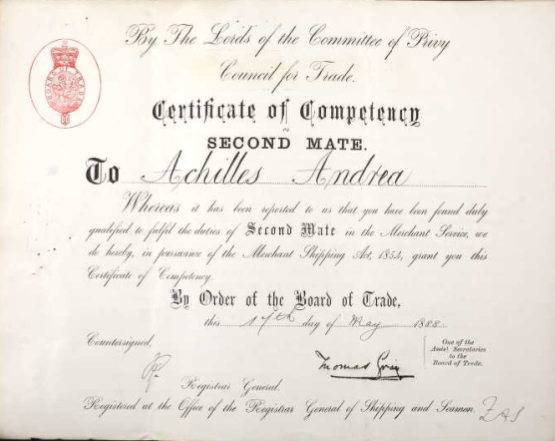 This database contains master and mate certificates issued to merchant seamen by the British Board of Trade. Some of the information is included on the back of the certificates, and some documents in a seaman’s folder have not been indexed, so when you find a record, use the arrows to browse surrounding documents to make sure you see all the records available. You may want to browse through an entire roll since the original folders were sometimes filed in random order.